Thanks for sharing your journey! I noticed you curled your SLs from the beginning. 1) Which curling technique did you find safest for new SLs? 2) I know you have tried pipecleaners, what is your opinion between them and wrapalocs? 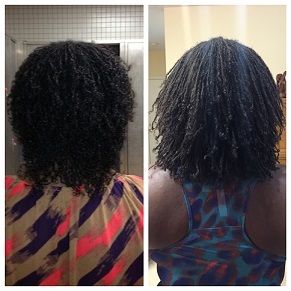 3) Has curling caused any adverse effects for you? If no, what are some tips/tricks you could share to minimize any potential mishaps with new SLs? 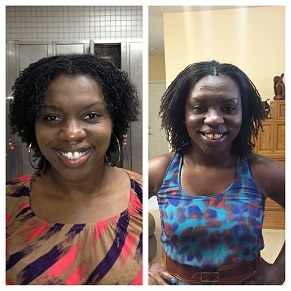 4) What so you think about grey perm rods as far as resulting curl? Hi Bea! Yes I did curl from the beginning. Primarily because I thought my locks were a little stringy looking (if that makes any senses). They hadn’t thickened up yet and I wanted to get the ‘full’ look. 1) I don’t think any type of curling technique is unsafe for new SLs. 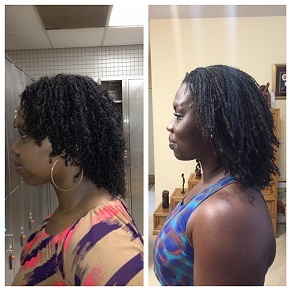 I would caution you not to use any curlers that pull on the locks (perm rods have a tendency to do this if they are put on too close to the scalp). I would also say try not to use heat. I typically never really use any heat. I would always leave the curlers in for days so that my locks could dry on their own. 2) I really disliked putting the pipe cleaners in and taking them out however I loved the end results. I will say that I probably won’t do them again. Ok maybe not ever again but not any time soon. They are time consuming. I have actually never tried the wrapalocs but if putting them in are easier than putting in pipe cleaners I would recommend using them instead. Pipe cleaners tend to snag and that’s not really good for new SLs. 3) Curling has never caused any adverse affects on my locks. Which is why it’s always my go-to method for styling. Updo’s tend to make my scalp hurt and anything restricting my locks can be uncomfortable so curls will always be my # 1 method of styling. So since there has been no adverse effects I don’t have many tips/tricks. I just caution you to never use heat. If you can, let your locks dry on their own. Try not to do styles last minute which might cause you to sit under a dryer. 4) I haven’t tried the grey perm rods. I’ve tried the yellow (which I believe are slightly smaller than the gray ones), purple, orange and green. But as my hair grew longer I found myself gravitating towards the smaller perm rods. This is because I don’t use any styling lotions on my locks. So the smaller the perm rod, the tighter the curl and the longer the style lasts (hope that made sense). Thanks so much for the thorough and thoughtful response! I think I am going to go with satin covered “pillow” rollers or satin covered foam rollers. What is your take on those? Awesome! Much luck on your journey, you will love it. I have not tried the pillow rollers however I’m curious to know their benefits. Be sure to post your thoughts and results. And sure I’d love to help any way I can. Just send me details about the feature. LOL! I bought the satin pillow rollers and then re-watched your yellow perm rod video and decided I am going to go with the perm rods. Those curls were awesome! I returned the satin pillow rollers today; then purchased some grey and pink perm rods! Thanks for being so helpful! Awesome!! Let me know how your curls come out. The yellow rods are actually my favorite. I do that hairstyle at least once every couple of months.